We need our neighbors and community to stay healthy, produce jobs, raise our children, and care for those on the margin. Institutions and professional services have reached their limit of their ability to help us. The consumer society tells us that we are insufficient and that we must purchase what we need from specialists and systems outside the community. We have become consumers and clients, not citizens and neighbors. John McKnight and Peter Block show that we have the capacity to find real and sustainable satisfaction right in our neighborhood and community. This book reports on voluntary, self-organizing structures that focus on gifts and value hospitality, the welcoming of strangers. It shows how to reweave our social fabric, especially in our neighborhoods. In this way we collectively have enough to create a future that works for all. Chapter 2: What Did We Lose and Where Did It Go? 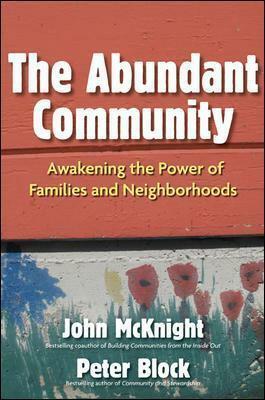 "The Abundant Community is a book that reminds us that our greatest strength as a people comes from the gifts of caring, aware communities and neighborhoods." --Frances Strickland, educational psychologist and First Lady of Ohio "Peter and John provocatively challenge us as individuals to understand the power of the individual and the potential of our work together. They also suggest local governments develop new ways of engaging and connecting residents to develop the assets available in all communities." --Robert J. O'Neill, Jr., Executive Director, International City/County Management Association "This is a magnificent book. It is intelligent, but more than that, it is wise. This book is the kukakuka (deep conversation) between two kupuna (wise elders), sharing stories, ideas, memories, regrets, possibilities, and hope and weaving all of it together for us. Read this book with your mind, heart, and spirit." --Puanani Burgess, Principal, One Peace-at-a-Time "In this slim volume there is theory and there is practice but above all, hope and a way out of the disconnectedness of our society. It remind us that the success of the American democratic experiment lies in the hands of its citizens." --James Keene, City Manager, Palo Alto, California "The Abundant Community presents an elegant and compelling argument... A powerful statement that can simultaneously enable our everyday politics and enrich our souls." --Carmen Sirianni, Morris Hillquit Professor of Labor and Social Thought, Brandeis University, and author of Investing in Democracy "This book is a remarkable and timely contribution. It proposes an inspiring alternative that pushes us to engage and reengage on this entirely possible journey of hope." --Jack Pierpoint, Publisher, Inclusion Press "The Abundant Community is both a gentle awakening and a powerful call to action. These ideas have inspired a network of community builders in South Africa." "In an era when we look to professions and institutions to address most of our community needs, or to fix our neighborhood problems, this book provides the refreshing and empowering perspective that what we most need exists all around us--a message that is as relevant in Mumbai as it is in Minneapolis." --Mary Coyle, Director; Gordon Cunningham, Assistant Director; and Alison Mathie, Manager, Research and Publications, The Coady Institute, and authors of From Clients to Citizens "We live in a world where every day many people experience loneliness, anxiety, and want. Many are hoping and wondering when the 'big break' will come. This book contains the map to the buried treasure. Locked in the secret code 'invitation, participation, connection' is the source of our wealth: our own and our neighbors' giftedness." --Judith Snow, social inventor and peace advocate "For over thirty-five years John McKnight and his colleagues at Evanston have labored to clarify the essence of mobilizing communities for health. Now writing with Peter Block the two offer us the E = mc2 of health. This book is destined to be a bible for public health and human services." --Dr. John R. Ashton, Chairman, United Kingdom Public Health Association, and Director of Public Health, Cumbria, England "This book exposes what economists have missed: the core economy of community. It provides the vision and the tools that put a life of mean- ing and abundance within our reach and answers the only two questions we need to ask: Why are we here? And what kind of world do we want to leave for those who come after us?" --Edgar Cahn, founder, Time Banks, and author of No More Throw-Away People "Block and McKnight go right to the heart of what we have to pay atten- tion to and do if we want to live in a better world. Their book is intelli- gent, practical, and well crafted. Use it to help make your world better." --Adam Kahane, Partner, Reos Partners, and author of Power and Love "This book gives us a new lens by which to see heretofore unseen limi- tations on and new possibilities for communal life. A useful guide for community organizers like me." John McKnight is emeritus professor of education and social policy and codirector of the Asset-Based Community Development Institute at Northwestern University. He is the coauthor of Building Communities from the Inside Out and the author of The Careless Society. He has been a community organizer and serves on the boards of several national organi-zations that support neighborhood development. Peter Block is a partner in Designed Learning, a training company that offers workshops designed by Block to build the skills outlined in his books. He is the author of Flawless Consulting, Stewardship, The Answer to How Is Yes, and Community. He is the recipient of numerous awards, most recently the Organization Development Network's 2008 Lifetime Achievement Award.